This week three one-day races are scheduled in Flanders and Wallonia. The first one is the Grand Prix de Wallonie on Wednesday September 14 with the finish at the top of the Citadelle de Namur. Next in line is the Championship of Flanders in Koolskamp on Friday September 16 and the day after the riders are heading to the GP Impanis – Van Petegem. Lotto Soudal have announced their line-ups. In the GP de Wallonie, the peloton rides from Beaufays to Namur for a total distance of 205.5 kilometres. During the race, the riders pass through Ardenne landscapes and they have to overcome seven climbs. In the first sixty kilometres there are three climbs close to each other: Côte de Saint-Hubert, Côte de Saint-Remacle and Côte de Werbomont. After these climbs there are no flat roads and the riders continue on smaller hills. In the finale there are three more climbs to overcome before the peloton is heading to the Côte de la Citadelle de Namur: the Côte d’Ermeton, Côte de Lustin and Tienne aux Pierres. The finish is located at the top of the Citadelle de Namur. Last year Jens Debusschere was the first to reach the top. This year he won’t participate, but maybe Tiesj Benoot, Tim Wellens or Tony Gallopin can take their first victory in Namur. The Championship of Flanders in Koolskamp on Friday consists of sixteen laps of 12.29 kilometres. On the flat circuit there is only one difficulty: a short passage on a cobblestone section. The cobbles are at the start of every lap and don’t influence the race a lot. It’s been three years since a Lotto Soudal rider took the victory in Koolskamp. 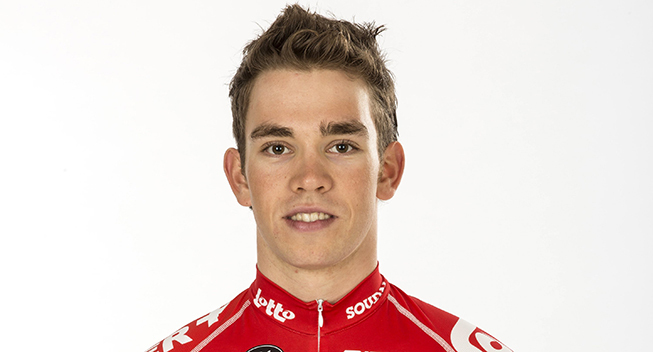 It was Jens Debusschere who won in 2013. Can a Lotto Soudal rider win again this year? The last race in this triptych is the GP Impanis – Van Petegem. The start of the race is in Brakel and the finish is 200.4 kilometres later in Boortmeerbeek-Haacht. During the race the peloton passes fifteen hills in various Belgian regions. The last climb of the day, the Everbergsesteenweg, is located 22 kilometres from the finish. The downhill and flat roads in the end suggest a sprint, but last year Sean De Bie surprised the peloton with a late attack. Even though the peloton tried to catch him back in the sprint, he rode solo to the victory. “I just came back from Canada. It was the first time that I had to race so far away so I’m curious how my body will react to both the races and the jetlag. I still have a few days to recover before the races in Belgium, but Friday is just around the corner. The races in Québec and Montréal have given me courage for the last part of the season. I rode really well and I’m happy with my results. “Like every other rider, I like to go back to the races that I’ve won, so I’m really looking forward to go back to GP Impanis – Van Petegem. In addition to that, the finish is only a few kilometres away from where I grew up so I’ll have a lot of fans along the road to support me and that makes it even more fun. Of course I hope I can bring home a second victory in the Grand Prix but my condition last year was outstanding. And unfortunately I don’t think they’ll let me attack again that late in the race! I’m sure the other teams will watch the finale of last year. If a rider attacks where I attacked last year, I’m pretty sure the peloton won’t let him go. But you never know, right? I’ll just see how the race evolves but I do think we should have a plan B in the back of our mind. Sander Armée, Tiesj Benoot, Kevin Deltombe, Fredrik Frison, Tony Gallopin, Greg Henderson, Jelle Vanendert and Tim Wellens. Kris Boeckmans, Sean De Bie, Jasper de Buyst, Kevin Deltombe, Frederik Frison, Michael Goolaerts, Greg Henderson and Pim Ligthart. Kris Boeckmans, Sean De Bie, Kevin Deltombe, Gert Dockx, Greg Henderson, Pim Ligthart, Tosh Van der Sande and Jelle Wallays.